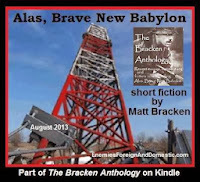 My friend, author and Navy Seal Matt Bracken, wrote a sobering essay recently Alas, Brave New Babylon. The essay posits the effects on middle America of a near-future civilizational collapse, triggered by an economic collapse, which in turn, is triggered by a sovereign debt crisis, caused by intemperate US spending and Federal Reserve bond purchase programs (QE-infinity). The essay is part story and part narrative, but is wholly harrowing and quite compelling. Matt got 3rd-generation Alaskan and talk show host Michael Dukes, who has a great voice, to read the essay. I shared the file so that others may have a chance to listen to it and perhaps we might avoid what Bracken predicts here. I am not posting the file to infringe anyone's copyrights. 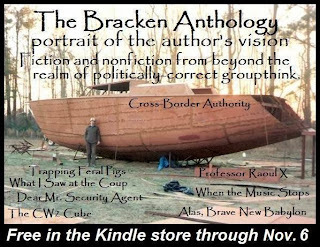 P.S., remember that this essay is part of The Bracken Anthology, which is free for the Kindle (and can be read on your browser) this week. I have read this previously, but thank you for sharing. You're welcome, Lee. I just wanted to make sure others could hear this important piece. Yup, good stuff, good historical perspective. I`ve just discovered Matt`s work and am now grabbing as much of his knowledge as I can. I only wish I wasn`t stuck here in the UK without anything "tangible" to repel attackers!!! Sorry you are stuck across the pond, even here we worry about our children.